Cozy, cute and warm; all of the elements of a perfect thanksgiving outfit! I'm so excited to cook and eat! Think this may be one of my favourite looks of yours.. what a great combination with the dress and boots. Love it!! Lovely outfit! I like the OTK boots with that dress! Rachael, this is so darling! The vest is perfect with the adorable dress and of course, the OTK boots totally elevate the whole outfit! Have a fabulous weekend! Such a cute dress! I love how you belted it to give shape. I love the belt you paired with the dress, it's the perfect touch! That vest is so pretty! I adore that fur vest!! And you are right - the belt totally suits the dress and gives it great shape. Love your style girl! I love EVERYTHING about this look! The layering, the boots, the belt! Have a lovely weekend! This is such a cozy holiday look! I absolutely love that you paired the patterned dress with black, thigh-high boots. Plus, that vest really adds a cute flair to the outfit. I could totally see myself wearing this. 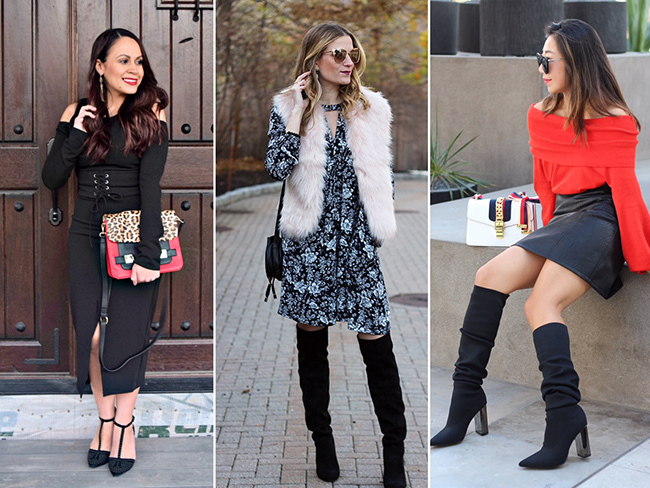 Dark floral, OTK boots and a fur vest, YES!! This is my kinda look, perfect for Thanksgiving! I really love Charming Charlie, they do have great clothing and accessories. I could spend hours in their store! That dress is so chic and stylish yet looks comfortable too. 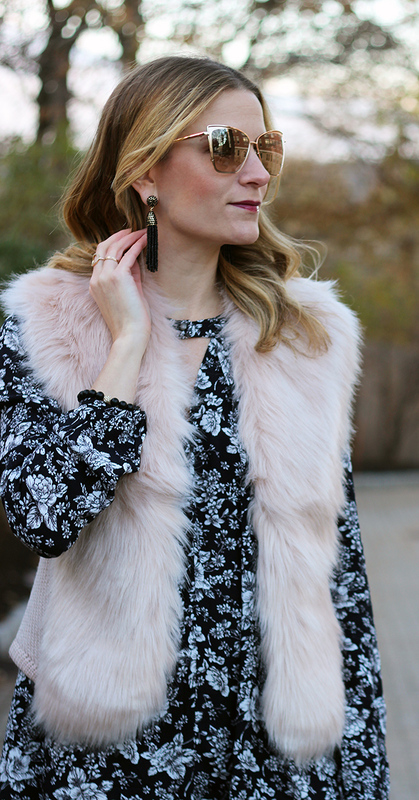 I love it with that blush fur vest and the tall boots! This outfit is perfect for Thanksgiving & looks so cozy! Adore that faux fur gilet of yours, Rachael. So plush. What a great look! Charming Charlie has so many cute things! Waoo that is awesome dress looks beautifull & stunning pictures..
What a fabulous outfit!! I just got a lighter fur vest, and I've worn it a ton! And thanks for joining us for On Monday's We Link Up! That's a pretty cute dress dear! Perfect for the over-the-knee boots.